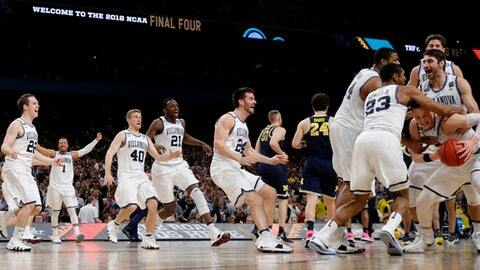 SAN ANTONIO (AP) Villanova was clearly college basketball’s best team in 2017-18, romping through the NCAA Tournament and capping it with a rout of Michigan in the title game. Now depression sets in for fans. It’s seven long months until the next game. We’ve got something to (hopefully) tide you over: A way-too-early Top 25 rankings for next season. 2. Kansas. The Jayhawks reached the Final Four in a season they weren’t even supposed to win the Big 12 title. Even with Devonte’ Graham gone, there’s plenty coming back especially if Malik Newman remains in Lawrence and more five-star help on the way. 4. Kentucky. As is always the case, lots of decisions await at Lexington. If a few players return, coach John Calipari’s Wildcats will no longer be the youngest team around. 8. Virginia. The loss to No. 16 seed UMBC stings, and the Cavaliers surely will use it as motivation. There’s also a nice core of players returning, even with the departures of Devon Hall and Isaiah Wilkins. 10. Nevada. The Wolf Pack took a big step in coach Eric Musselman’s third season. Another such step could follow, with twins Caleb and Cody Martin back and more transfers on the way. 13. Oregon. The Ducks could be looking at a return to the NCAA Tournament with a top-five recruiting class, headed by big man Bol Bol – son of ex-NBA star Manute Bol – joining Payton Pritchard and Troy Brown. 23. Arizona State. The Sun Devils‘ guard trio of Tra Holder, Kodi Justice and Shannon Evans II are gone. Transfers Zylan Cheatham and Rob Edwards will be around, joined by a strong recruiting class.